Saudi Arabia, October 30, 2018: The Ideal Teacher Center, an affiliate of Dar Al-Hekma University, marked the World Teachers’ Day on Wednesday October 3rd by launching the Ideal Teacher Program Seventh Session under the theme “Innovative Learning Institution”. Monetary prizes for innovative schools and teachers were announced with SR10,000 for first place; SR7,000 for second; and SR5,000 for third. A large number of faculty members attended the event. Dr. Sanaa Askool, Director of Consultation and Business Development Center, delivered the opening speech on behalf of Dr. Suhair Al-Qurashi, President of Dar Al-Hekma University, in which she talked briefly about the history of the non-profit center, which was established in 2015. Dr. Askool stressed the important partnership between Dar Al-Hekma and Jeddah Educational Office, noting that such partnership is based on the importance of creating an innovative learning institution where each member plays a role in producing knowledge. Around 20,000 men and women have benefited from the various programs offered by the Ideal Teacher Center. The center’s mission and objectives focus on developing and training leaders and faculty members in order to prepare modern teachers who will in their turn prepare a promising generation, she said. Dr. Mona Karim, director of the Ideal Teacher Center, gave a short brief about the center’s programs, the many courses and educational workshops offered by the center, which focus on meeting the needs of female teachers. The center organized trips to teachers to travel to Japan, Finland and other countries in order to hone their skills over there and apply international experiences to local schools when they return home, Dr. Mona said. Different segments were organized during the event such as ‘The Best Nation’ Play, supervised by Samira Fikri, and ‘Blessing of Change’ initiative, which reflects the social partnership between Dar Al-Hekma University and various educational institutions. 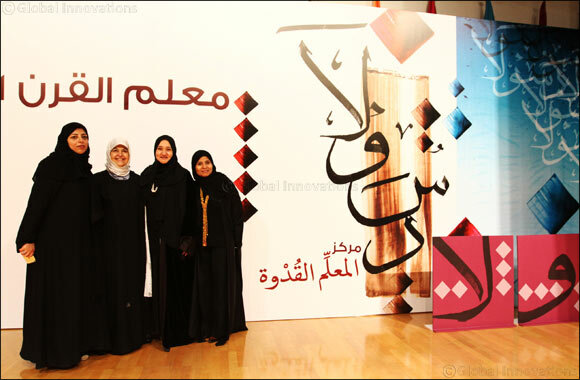 The female graduates who hold the Ideal Teacher Program diplomas delivered a speech on the occasion of graduation. The Ideal Teacher Center is non-profit and run by Dar Al-Hekma University. It aims to develop and train male and female teachers and arm them with innovative skills and excellent teaching methods. The theme of the program focuses this year on transforming institutions and individuals into learners and producers of knowledge, an objective which Dar Al-Hekma University seeks to accomplish through the center.